I’m back and blasting off today as we ponder the weirdness of a strange signal from somewhere very far away. While humanity enjoys alien invasions in the fictional realm, there are people who do believe that there may be life on other planets. After all, the universe is weirdly vast and very empty. Despite a belief that life on our planet is a fluke, scientists still look to the stars in search of the possibility of life on other planets. 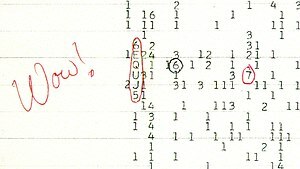 That’s where SETI comes in, the search for extraterrestrial intelligence. It’s an institute, as well as something of a group effort, some of which is volunteer, to look for little green men out in the sky. It’s a wonderfully stubborn search, even when the stars tend toward silence. On August 15 1977, something yelled across the cosmos for our attention. The Big Ear was a radio telescope that was once located in Delaware Ohio, doing its work for the Perkins Observatory. Basically, the Big Ear was listening, as it had since 1963. It was at night, in August. Sagittarius was in the sky, and the telescope passed over this particular region. Easy to do, since that is when the Sagittarius constellation (and the Galactic Center of the Milky Way Galaxy) is most visible. And then it started. The radio signal, growing stronger in an arch, then fading again for all 72 seconds that the radio telescope passed over the area. When Dr. Jerry Ehman was looking at the readings later, he wrote “Wow!” beside that particular occurrence. That’s where the signal got its name, but the presence of the noise, while unusual, wasn’t the weirdest part of this galactic tale. It’s never been detected again. Not once. Not even with more senstive instruments that replaced the Big Ear later, like the Very Large Array. Ehman is known to have believed once that the source was terrestrial, a mistake as a result of a very specific set of circumstances that would have to induce a perfect opportunity that would possibly have the potential of being repeated. Military? Maybe. Anything like that is possible. The frequency at which the signal occurred is actually protected from use for any purpose other than astronomical studies. Of course, that wouldn’t keep the government or military from using it if they needed to, but there doesn’t seem to be a reason for it.